Mrs Weller. 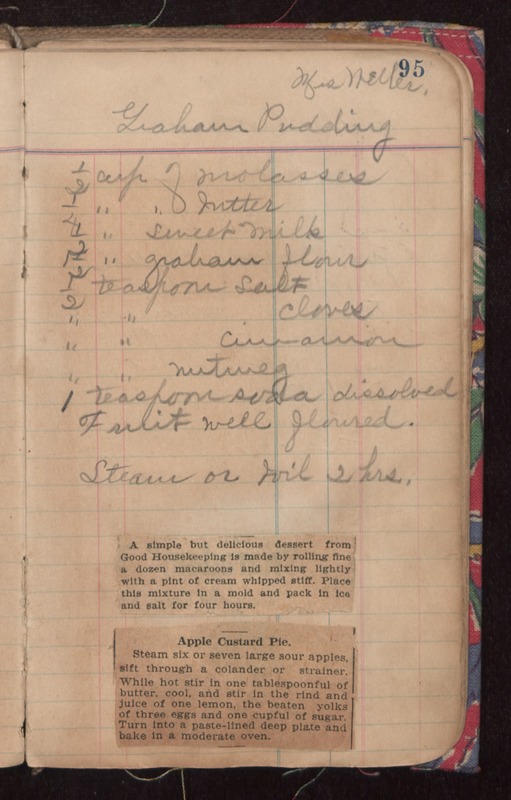 Graham Pudding 1/2 cup of molasses 1/4 " " butter 1/2 " sweet milk 1 1/2 " graham flour 1/2 teaspoon Salt " " cloves " " cinnamon " " nutmeg 1 teaspoon soda dissolved Fruit well floured. Steam or boil 2 hrs. A simple but delicious dessert from Good Housekeeping is made by rolling fine a dozen macaroons and mixing lightly with a pint of cream whipped stiff. Place this mixture in a mold and pack in ice and salt for four hours. Apple Custard Pie. Steam six or seven large sour apples, sift through a colander or strainer. While hot stir in one tablespoonful of butter, cool, and stir In the rind and juice of one lemon, the beaten yolks of three eggs and one cupful of sugar. Turn into a paste-lined deep plate and bake in a moderate oven.